The 66 Labour MPs who voted with the Government on the main motion to support “taking military action, specifically airstrikes, exclusively against ISIL in Syria” represented well under a third of the 231 current Labour members of Parliament. They included 11 out of 28 Commons members of the shadow cabinet, six junior shadow ministers and three whips including the deputy chief whip, Alan Campbell. Rosie Winterton, the chief whip, abstained. They also include two out of four leadership candidates (Yvette Cooper and Liz Kendall) and all 5 deputy leadership candidates from this year’s contest, as well as two former acting leaders (Harriet Harman and Margaret Beckett). The one other former leader, Ed Miliband, voted alongside Jeremy Corbyn against military action. Posted in: International, Middle East/North Africa, Politics, War/Defence, Westminster. Well so much for the British Labour party then. It’s gone exactly as I predicted and few things have ever saddened me more. We are in for two/three years of infighting and battles with the Progress mob and in the end I can see either Corbyn stepping down or the party splitting. The right wing Progress group are struggling lack of members and smaller numbers of MP’s backing it, so now we all can see the issue with Watson and the Eagles moving to the right. I knew Watson would change direction the bloke is always looking for a move ahead to improve his standing. Benn looks to be the new leader of the right. Given the current preoccupation by some of becoming a victim, it might have been wiser to include the names of those voting with longer term strategically thoughts. Everyone votes with his or her eye on the future that is what careerist do, but now we will see if Corbyn has the where with all to work with people like Eagle and Watson and Benn because Benn looks every bit a leader in waiting for the right. This is politics you should know this people are always looking for the edge. Indeed. Benn’s fine words buttered no parsnips. Benn avoided addressing the absence of a credible and coherent strategy for intervening in Syria. Instead Benn used the occasion to launch his leadership campaign. And the speech I suspect was written by one of Blair speech writers because it was totally Blair like. This is a fight for labour…. Is there a list of Labour abstentions too please. Publicwhip’s definition of rebels is not correct, and is only there because that site is compiled by people with no real knowledge of politics. 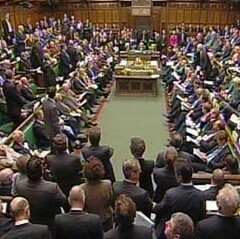 A rebellion is a vote against the party whip; an MP cannot rebel in a free vote. The vote yesterday was a free vote. Well of course we all know the MP’s who did vote in the free vote against the leader, so this is a direct attack on the leader. Benn is now looking to be as a right wing leader in waiting. The Right in both the PLP and capitalist press are really scraping the barrel to put the “Mr Chipps” lookalike toff, Benn , up as a torch bearer for an alternative Labour Leader. His speech may have enthused the press and Tories as the best speech since Churchill’s “Fight them on the beaches ….”, but it was actually just slippery , cynical , contentless, rhetoric. Hard Luck Blairites – the PLP talent pool for the new rightist leader is still empty. Keep looking for that alternative leader to bring Labour back to the neoliberal fold, guys, but the pompously upper crust Benn just isn’t going to do it. The thing is even if the 60 MP’s or what ever it is had voted labour they would have lost anyway, so the labour people who went against the leader and I include the Eagles who state they are lefties and of course Watson who only interest is himself and the other Progress tribe. The battle has never been the Tories the battle is sorting out labour progress elite.. I agree about Hilary Benn’s speech. It has been described as “barnstorming”, “brilliant”, “among the great Commons speeches” and so on. I have watched it and read it. It is, as you suggest, devoid of military analysis. It is a demand that we engage in action for purely political reasons without analysing their military objectives or effectiveness. It fails also to consider and evaluate alternatives. It is a very poor speech indeed. The fact that the speech has been so highly praised only demonstrates the low standards of the HoC and the extreme limitations of most of the political commentariat. Having seen a random selection of the speeches, what most stood out was how lightweight the PLP really is. Many of those speeches got little further than repetitive observations of how bad ISIL is, with the consequences for bombing without strategy or end point. All this talk of conscience is a label for doing what they FEEL should be done, without having to think through and argue why. This demonstrates the tremendous effectiveness of Blair in successfully distracting some and clearing out other potential activists and ‘politicians’ from ever engaging in (Labour) Party politics. There has no doubt been a generational price to pay, resulting in some weak performance/activity/engagements (or leadership, shadow cabinet candidates). The lacklustre 3 probably has an equivalent throughout the Special Adviser generated and trained PLP. When Tony Blair had a free vote on changing abortion, and was leader of the opposition and he was against the Tory law in 1995′ were those labour back benchers who voted in a free vote, rebels? If the right wing regained control of the party the party would be over. They are finished. New Labour has had its day. 13 years of corruption and criminality in power and two lost elections including complete eradication in Scotland means they are electoral poison. They have nothing to offer. The ringing applause that Benn received from the Tories yesterday is but another nail in their coffin. The only way back for them is if Corbyn allows it and then all they can offer is to be reduced to about Lib Dems size in the 2020 election. Mind you Corbyn’s impression of an oppositional back bencher as if he hadn’t won a convincing victory in the very recent leadership election isn’t helping. Look if we don’t de-select the New Labour MPs the British public will at the ballot box and that will be the end of the Labour Party. Just keep focussing on fighting for the oppressed in the and internationally and in treating diverse people in equality. And organise to get power back back to grassroots members and Conference. And in a few years time select good left democratic socialist Parliamentary candidates who back Jeremy and grassroots opinion. I think I will ask: Do you think members should be seen but seldom heard? Just finished reading my Sun, polishing my Royal Family mug and saucer and and just writing to Santa for Jeremy, and you’ll never guess what I’ve asked for (for him) but think he will be pleased. Oh for myself its the usual Beano album but more later, now its time to pray. God bless us all, everyone of us (of all religions and of none and all of humanity in its wonderful diversity). Have to go now, off carol singing – I need the money and I am bloody good – will give some to food bank then off to pub! Line 1 should be in the UK & internationally – sorry emotionally drained! We all have a right to be critical and offer ideas and opinion plus as democratic socialists we passionately care about humanity, that’s why we are socialists – but we are not perfect, we are human. But we should never abuse or threaten, we should try to be like the World we want to be – but because WE CARE, passions can run high – it’s what makes us human. But some comments have been overboard and Jeremy’s message was good. Most of us are constantly learning. But it’s hard when you see killing, it breaks your heart. And brothers and sisters we had a pyhrric victory today as they bombed oil refineries although they were likely to have been populated by human beings (we couldn’t really canvass the workers to see if they were pro-so called IS). The extreme right so called IS supporters make the mistake when carrying out indiscrimate attacks on the public around the World by trying to justify it by saying you supported wars etc. but instead of looking at the West as homogenous people they should recall that millions in West protested against the war in Iraq etc. Love, peace & international solidarity.